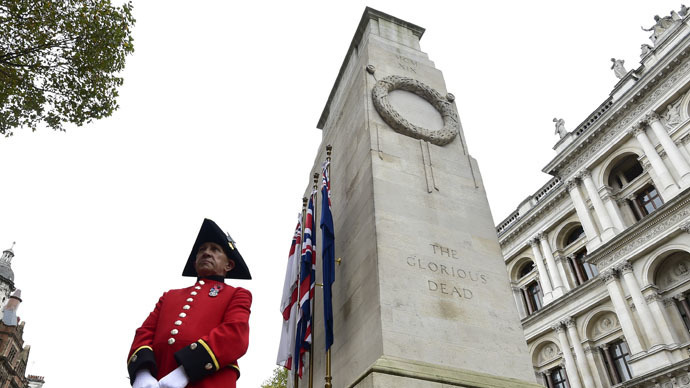 Military veterans, their families and members of the Royal Family will later pay tribute to the British defense personnel who lost their lives in the Afghanistan conflict, in a service to mark the end of UK involvement in the war. Speaking ahead of the memorial service, which will take place on Thursday at St Paul’s Cathedral, the Afghan president paid his respects to the soldiers. The service in London will be partnered with a simultaneous event in Afghanistan, for troops still serving. Prime Minister David Cameron, the Prince of Wales and the Duchess of Cornwall, and the Duke and Duchess of Cambridge are expected to attend the service, which will be followed by a procession through London. UK troops have been stationed in Afghanistan since 2001, when a US-led coalition invaded the country after the 9/11 attacks. After a new government was set up in December 2001, the Taliban remained a covert fighting force that has killed thousands of foreign and Afghan troops since the beginning of the invasion. They are one of the most powerful groups in the country and even declared they had “defeated” the coalition when NATO ended its combat operation in December. At the peak of the mission, there were 9,500 British troops stationed in Afghanistan. One mother of a serviceman killed in action told the BBC she was proud to be attending the service. Anne Linley’s son, Staff Sargent Brett Linley, was killed in 2010 as he worked to defuse improvised explosive devices. He was posthumously awarded the George Medal for ‘great bravery’. Linley said she was “looking forward” to the service, saying it was a “great honor” to be part of the event. “I'm looking forward to it, but dreading it at the same time because you don't know what kind of emotions it will bring forward,” she said. “I miss him all day long ... we carry him in our hearts and always will,” she added. The ceremony has not been welcomed by all parties, however, with pacifist campaign groups eager to condemn the legacy of the invasion. “This service, with its RAF fly past, is an attempt at a victory parade where there has been no victory. There is something grotesque in the assembly of royalty, politicians, generals and a cross made of shell cases,” the spokesperson said. “No doubt representatives from the arms companies will be lurking in the background. “Several tens of thousands of civilians died as a direct result of the war, and many thousands more died as a result of the general break-down of Afghan society which ensued,” the group added. The coalition further claimed the war did not improve living conditions for Afghan citizens. The sentiments from the Afghan president, though, appear to welcome Western influence and contrast greatly with the anti-West sentiment of former President Karzai, who remained adamant that the British presence had made things worse.